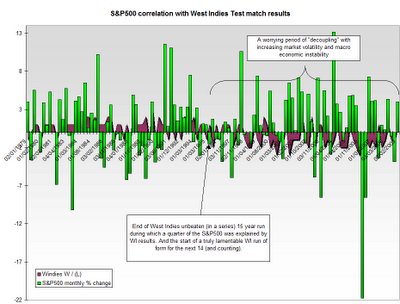 WI cricket and Equities: resistance is not futile. With Allen Stanford generating even more interest in the media than his certificate of deposits there is nowhere in greater need of some cheer than Antigua where his offshore business headquarters sits and where 5% of the population are employed by him. 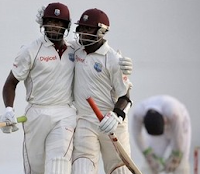 Well, they got a very tiny sliver of comfort yesterday (and that's a Bloomberg report no less) when the region's cricket team performed the Great Escape from what was certain defeat. But, obviously, in the Grand Scheme of Economic Things this is small beer. NB: Image cropped from original photo by Andres Leighton (AP). Link here to it and other shots of the match.